I still haven't been reading in the quantities I'd like this summer, however the quality of the books I do get to makes up for it. I recently read two very interesting and enjoyable books. 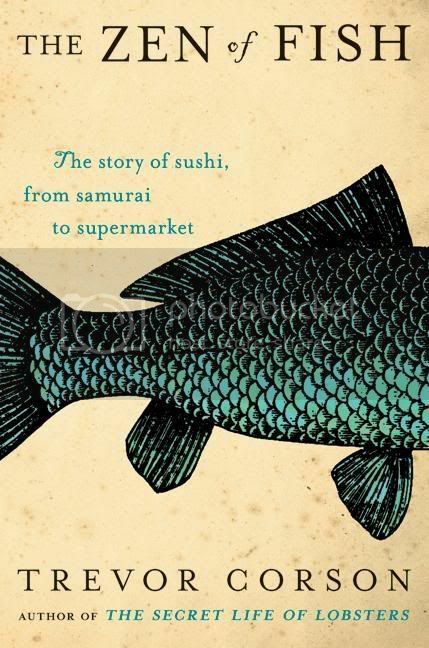 First was The Zen of Fish, from samurai to supermarket by Trevor Corson. Trevor joins a class at a small California Sushi School, where students are taught the art of Sushi Chefing over the course of a few months. Traditionally, Sushi chefs are required to train for at least 5 years. With the high demand for Sushi joints in the US, however, this quick schooling became a must. The book is so....cool! You have the drama and humanity of the students and teachers at the Sushi school. You have humor. You have lots of information. Information-wise this book could fit in on a reference shelf easily. I learned so much! In fact, I'll have to re-read parts because there was so much to take in. But it doesn't feel like you're reading a fish encyclopedia or something. It's actually fun to read, because there are characters and good writing and humor. The information comes in tidbits, most of which made me exclaim "Oh man!" or "Ah-ha!" or something dorky like that. Trevor's website is great! Here's a video about how to eat sushi. A funny essay on how he came to pick Sushi as a book topic. 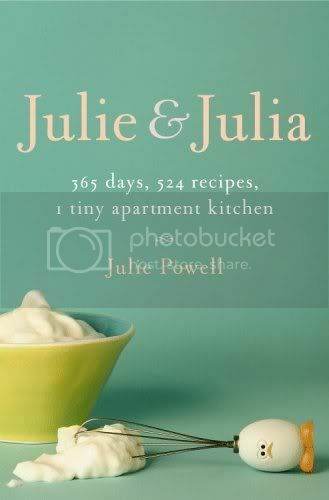 Julie and Julia: 365 Days, 524 Recipes, 1 Tiny Apartment Kitchen by Julie Powell is a book I've seen lots of places. I finally got around to reading it, and am very glad about that. It's Julie's story of her struggles with turning 30, being a temp worker, and general New York married life. On the verge of a nervous breakdown, she takes solace in Julia Child, specifically the cookbook Mastering the Art of French Cooking. She discovers blogs, and decides to give herself a project. Make every recipe in the book in one year, and chronicle the journey on-line. Julie is my age when she takes on this challenge, but I think people of all ages can identify with her. She's no domestic goddess...she describes her messy kitchen and poor housekeeping skills. She is funny and she cusses alot...especially when cooking the French food. She drinks too much and loves watching Buffy the Vampire Slayer. In other words, she's very normal (except her writing is fantastic. ), and someone you can see yourself being friends with. From the frustration of failed mayonnaises to the triumph a perfect chicken, the book takes you along on Julie's rollercoaster of achieving her goal. You feel her pain when she misses a step in a recipe and has to either start over or improvise. You cheer for her when she's near the end of her goal. It's a fun and inspiring ride. Here is the original Julie/Julia Project blog. I'm looking forward to reading all the posts, after reading the book all about it. A recent interview with Julie Powell. Looks like she's learning butchery for her new book project! Can't wait for that to come out.